Splenic tissue of human fetuses from the 14th to the 24th week of gestation (menstrual age) were investigated by light- and electron microscopy to describe the development of the red and white pulp in close relationship to the differentiation of the vascular tree. Special interest is focussed on the differentiation of the T-cell- and the B-cell regions and their specific stationary cells. The preliminary stage, here called the “primary vascular reticulum,” lasts up to the 14th gestational week (gw). Numerous erythrocytes, normoblasts and macrophages are seen among a network of mesenchymal cells and argyrophilic fibers. Hematopoiesis, especially erythropoiesis, can be recognized. The characteristic organ structure becomes established during the subsequent transformation stage of the fetal spleen, beginning with the 15th gw. Splenic lobules begin to form during the 15th to 17th gw. They consist of a central artery, surrounded by a sheath of lightly stained stationary cells which resemble myofibroblasts. At the periphery of these lobules the red pulp forms. Initially mobile cells are distributed throughout the reticulum. Soon they begin to accumulate in the venous sinuses, which develop from lacunae among the reticular network and come into contact with the venous system. The endothelial wall of these sinuses remains discontinuous, confirming the theory of the “open” vascularization of the spleen. The development of the larger veins is correlated with the differentiation of the splenic trabeculae. The development of the white pulp is correlated with the stage of lymphoid colonization within the spleen, beginning around the 18th gw. An accumulation of lymphocytes around the central arteries can be recognized during the 19th and 20th gw. These lymphoid cells show morphological and immunohistochemical characteristics of T-precursor cells. Within the now assembling periarterial lymphoid sheath (PALS) a few precursors of interdigitating cells (IDC) are recognizable, giving evidence for the differentiation of the T-cell region. Around the 23rd gw the assemblage of primary follicles is discernible at the periphery of the PALS. 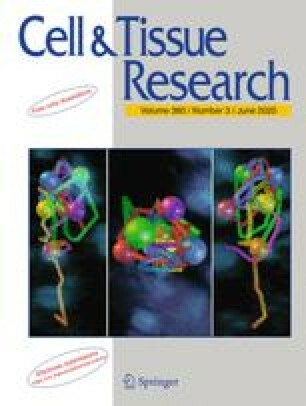 Precursors of the follicular dendritic reticulum cell (FDRC), the specific stationary cell of the B-cell region, have been recognized. This observation leads to the conclusion that the small primary follicles represent the beginning formation of the B-cell region. The significance of the vascular system for the differentiation of the specific splenic organization is discussed.